Born in Florence during the High Renaissance, at the young age of 12, Albertinelli became of pupil of Cosimo Rosselli (1439 – 1507). In Rosselli’s workshop, Albertinelli befriend another pupil, Fra Bartolomeo (1472 – 1517), and the two painters would go on to open a collaborative studio in Florence. Albertinelli aspired to improve his drawing, studying the ancient artworks in the Medici Garden. 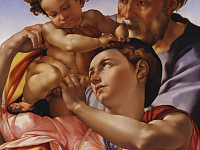 The artist was also influenced by the sculptural style of Raphael (1483 – 1520). When the Medicis were temporarily banished in 1494, he returned to working with Bartolomeo, whose manner he copied so assiduously, according to Giorgio Vasari (1511 – 1574) that their works were sometime confused. When, in the wake of the morality campaign of the reformer Girolamo Savonarola (1452 – 1498), Bartolomeo joined the Dominican order in 1500, (hence his name Fra or Friar Bartolomeo) and temporarily gave up painting. Albertinelli, beside himself with the loss, would have joined him; but, spurred by his success in completing an unfinished Last Judgment of Bartolomeo's, he resolved to carry on alone. Also in the Uffizi is Albertinelli’s Annunciation, Nativity and Presentation in the Temple, a predella of the Visitation, which was painted for the Chapel of Congregazione di San Martino (later Church of Santa Elisabetta) in Florence. In this piece there is also Albertinelli’s use of balance and the laws of perspective with figures who capture a strong narrative. Among Albertinelli’s many students were the influential Jacopo da Pontormo (1494 – 1557) and Giuliano Bugiardini (1475 – 1577).